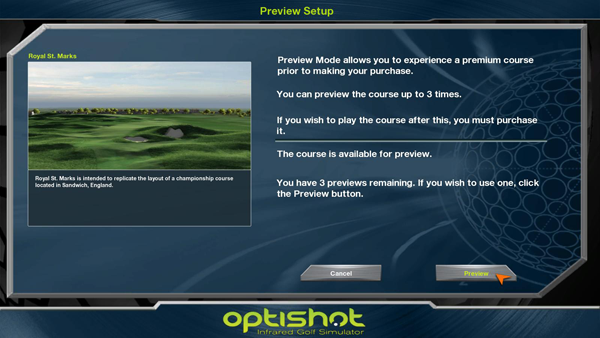 Optishot 2.5 allows you to preview Premium Courses prior to purchase. 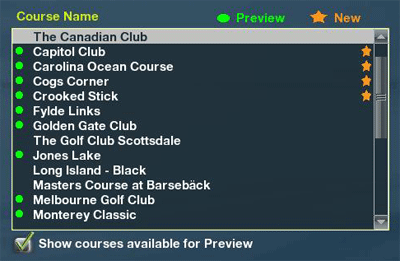 Dancin' Dogg Golf now allows users to Preview Premium courses prior to purchase. Each Premium course is available for three previews. You can Preview the course in either Game or Practice Mode. The first two holes of each course is available to experience. When you enter a Premium course, one of the three available Previews is used. Once all three Previews have been used, you must purchase the course in order to continue to play it. In the list of courses, you will see some that have a Green Dot icon next to the name. These are Ppremium Courses that are available for you to Preview. If you have already purchased a Premium, it will not have this icon. You can select one of these courses and see the course image and description to the right in the setup window. The Play button will now read Preview. Clicking on this Preview button will take you to the Preview Setup window. The Preview Setup window will let you know how many previews you have remaining for this course. To use one of your remaining previews, click the Preview button. Course has not yet been installed on your computer, this window will allow you to download and install it. To download the course, simply click the Download button. Once the download is complete, you can Preview this course.